Here's another good one from Mario Batali's new cookbook: Molto Gusto. We made this early in the week for dinner and just loved it. Loaded with fresh vegetables and relatively easy to make this was a perfect weeknight meal for us. I'm sending this over to Janet of The Taste Space to be included in this weeks' Presto Pasta Nights roundup. Don't forget to check Janet's blog on Friday; there's sure to be some great pasta dishes. Add the sliced asparagus and cook for 2 minutes, then add the asparagus tips, peas, and scallions season well with salt and pepper. Cook stirring, until all the vegetables are just tender, about 2 minutes longer. Remove from the heat. Bring 6 quarts of water to a boil in another large pot. Drop the pasta into the boiling water and cook until just al dente. Drain the pasta, reserving a cup of the water. Add the pasta and 1/4 cup of the reserved pasta water to the vegetables, stirring and tossing over medium heat to mix well. Cover, reduce the heat to low, and allow to steam together for 2 minutes. Stir in the remaining 2 tablespoons olive oil and a splash or two more of the reserved pasta water if necessary to loosen the sauce, then stir in the herbs and serve immediately, with grated Parmigiano on the side. What a great, vegetarian pasta dish. 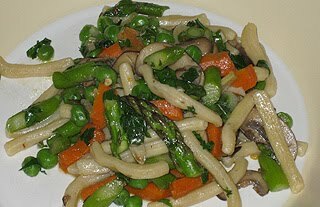 I love mushrooms paired with asparagus! What a great way to use the abundance of veggies I have right now! There is nothing like very fresh, very local veggies to add to this now that summer is here. Thanks for sharing with Presto Pasta Nights. Primavera is such a fantastic way to use up summer's veggies! I have this cookbook and need to cook from it! Looks awesome. I love all of the vegetables and fresh herbs - healthy and tasty! I love pasta dishes loaded with vegetables, and all the herbs sound great here too. Mario's new book sounds like a good one! So colorful and delicious looking! Mario's cookbook is on my wish list! This sounds really good and healthy too. I bet it would be delicious cold as well. This a perfect pasta for summer. It would be great with so many fresh garden veggies. Great summer dish! I love all the veggies! Thanks! This looks like a great way to bring together my favorite summer vegetables. I love a good pasta - veggie dish.... and this sounds wonderful!